Do you have ancestry in the Pine River district? The earliest inscription relates to the death in 1866 of John Charles Richards, infant son of Thomas and Elizabeth Richards, in Samford Cemetery. 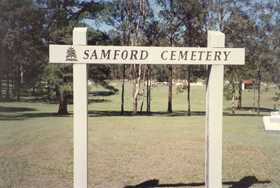 Bunya Cemetery is no longer in use but Dayboro, Lawnton, Samford and Samsonvale Cemeteries all have recent burials. Transcription completed June 2002. This is a wonderful genealogy tool if you're exploring your family history or building a family tree and have ancestors from this district.